Quantum dots (QDs) are the semiconducting inorganic substances that form luminescent nanocrystals with unique optical properties. The formation of shell and or functionalization of it may be utilized as probes or carriers for target-specific cells or tissues for proper utilization in the field of regenerative medicine. Thus, the association of chitosan makes the entire body as biocompatible and suitable for optical stability in physiological environment. QDs-bound hybridization probe design reported for detection of intracellular pre-miRNA using chitosan poly(γ-glutamic acid) complex as a gene vector toward the progress and prognosis of cancer. It is also demonstrated that chitosan-based QD hybrid nanospheres can be internalized by tumor cells and hence act as labeling agent in cell imaging by optical microscopy. The challenge of such cell imaging in the field of molecular imaging is also being discussed. 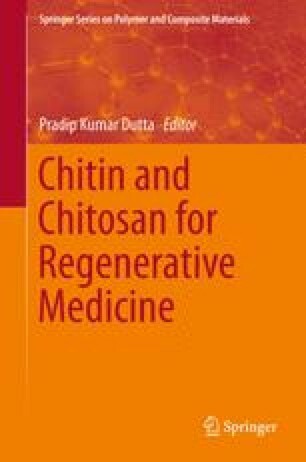 Overall, the interest in using chitosan–QDs in regenerative medicine and the current barriers to moving the technique into the clinic as great challenges will also be discussed. One of the authors (HK) gratefully acknowledged the financial support from UGC, New Delhi and TEQIP-II, MNNIT Allahabad during his Ph.D.Thesis work.